Functional Jaw Orthodontics: the key to a beautiful natural smile, profile and symmetrical face. When the bones in the head and neck are out of alignment, it’s more than just your smile that can suffer. You could be at risk for TMD, headaches, neck pain and sleep apnoea. Functional jaw orthodontics can help by idealising the jaw size and position as well as idealising the head position over the neck and spine, which can help maintain a clear airway and make sure the TMJs are stable. Functional jaw orthodontics also offer beautifully wide smiles, stunning profiles and symmetrical faces – all while avoiding extractions. Removing teeth to make room to straighten crowded teeth can have dire consequences for the face, TMJs and airways. As a child the changes in the face may not be too obvious as they are still blessed with youthful skin, however as they get older the face tends to get longer, dished in, the head posture becomes gradually more forward, which can then place a lot of strain on the spine. As the facial changes occur, the lower jaw ends up growing further and further back, which then places pressure on the airway. Removal of teeth also means less room for the tongue due to narrower arch form. With less room for the tongue and a compromised airway it is almost certain that sleep apnoea will occur as your child becomes older. Functional jaw orthodontics on the other hand help to grow the jaw to the ideal size, leading to broad smiles, full profiles and larger airways. Treatment by Dr Shah and Dr Dowker. 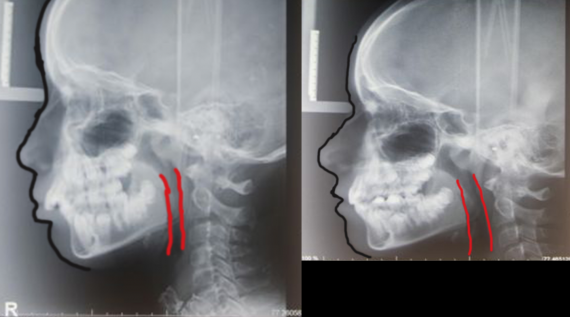 Early treatment in an 8 year old patient shows the great change in facial profile as well as the increase in the size of airway following functional orthodontics. Treatment has also corrected crowding and the deep bite. Treatment by Dr Shah. Early treatment has allowed correction of a severe open bite (teeth not touching), narrow upper jaw and cross bite all of which are associated with TMJ and sleep apnoea. At TMJ Centre Melbourne we look at the causes of incorrect facial growth. Finding the root of the problem will avoid relapse of treatment, which is all too common with traditional orthodontic approaches. The key to getting ideal facial growth is to ensure nasal breathing, correct lip posture and correct swallow patterns are established in conjunction with ideal orthopaedic appliances. Dr Shah is well versed in using many different systems/appliances to allow individual tailoring for children and adults. At TMJ Centre Melbourne you will also receive care from Dr Dowker (Holistic Chiropractor) simultaneously to help correct any dysfunction in the cranium, neck, back and the rest of the body. This will make treatment times quicker and help correct posture. We diagnose holistically looking at what may cause your mouth breathing in the first place, this is often due to a combination of diet, incorrect habits, structural deformations and narrow upper jaws. Unfortunately, many of us did not have the opportunity to have orthodontic treatment as children. Some of you may have had teeth removed and now suffer from TMD/Sleep Apnoea. Fortunately, it is still possible in most cases to correct deep bites, reopen extraction spaces, broaden smiles and treat TMD with functional jaw orthodontics without the need for surgery, as long as no gum disease or jaw joint disease has occurred. Using our combined approach of functional jaw orthodontics and chiropractic care, we can make treatment quicker, painless and give you back your life and help you avoid jaw surgery. Treatment by Dr Shah on adult patient. Note the space that has been created within 4 months WITHOUT SURGERY. Treatment by Dr Shah – note expansion of the top jaw in an adult WITHOUT SURGERY or BRACES. If you have suffered from TMD or sleep apnoea, your children may also suffer the same issues in the future. We strongly recommend assessing your children by the age of 6, as early treatment provides the best results. Early treatment can also help you to avoid the need for braces and/or surgery. Please come in for our comprehensive assessment and diagnosis.